BsnTech Networks was contacted by Greg and Chane’l, owners of On the Move Coaches. They were in desparate need for a big upgrade to their website compared to the one they had. After working with them for a little over a month, they were very happy with how the site looked and wanted to launch it. Today, we have launched their new website! There are still a few items that they want to have changed, but they wanted to have their older, ugly site removed as quickly as possible. We appreciate the business from Greg and Chane’l and look forward to providing some SEO services in the near future! 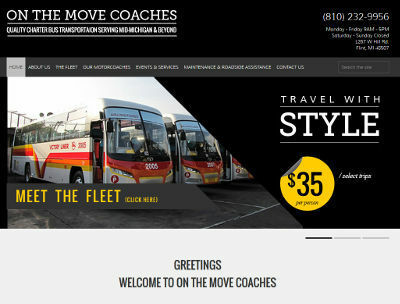 On the Move Coaches website is at onthemovecoaches.com.